Fantasy Flight has definitely nailed down the formula for the living card game formula. With The Lord of the Rings, Star Wars, and Game of Thrones LCGs, they have provided a constant stream of content to gamers who want to revisit those worlds with new objectives. They took Arkham Horror and created The Card Game that recreates the world of the board game without complicating the rules. 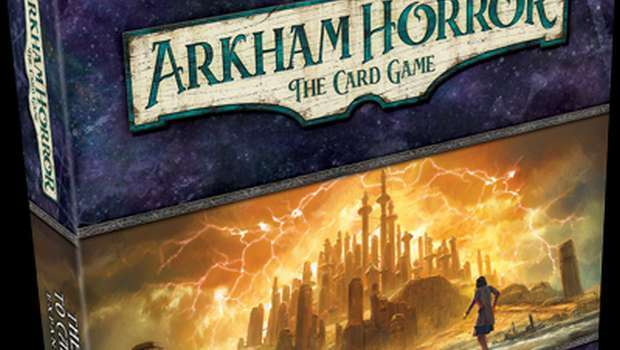 This fall they’ll be producing their second deluxe expansion for Arkham Horror: The Card Game, The Path to Carcosa. A new theater production is coming to Arkham all the way from Paris. Unsurprisingly, it’s been all the rage in conversations among Arkham’s socialites. But in your efforts to learn more about the play, you’ve uncovered a darker history. Disappearances. Suicides. Delusions. Insanity. Wherever The King in Yellow is performed, madness follows close behind. In The Path to Carcosa, it becomes your task to uncover the secrets of this unusual play. The expansion’s two scenarios kick off The Path to Carcosa campaign with a trip to the Ward Theatre and an invitation to the formal dinner party hosted by cast and crew. But with every answer you gain and every clue you uncover, you only find yourself falling deeper into mystery and madness. The King in Yellow—and all the strange events surrounding the play—take center stage in the two new scenarios from The Path to Carcosa. Curtain Call is your ticket to Ward Theatre, where you can catch the much-awaited performance. And in The Last King, you join the play’s cast and crew at a dinner party, in the hopes that some of them might provide you answers to the many questions burning in your mind. Both of these scenarios can be played on their own as standalone adventures, but together they represent your first steps along The Path to Carcosa campaign, which you can pursue more fully through a cycle of six Mythos Packs. Over the course of your campaign, you’ll learn more and more about the larger threat the play may pose—and encounter many of the terrifying new treacheries and enemies from the expansion’s eleven encounter sets. And you’ll find yourself keeping secrets from the other investigators. As befits its unique exploration of the realms between and beyond sanity and madness, The Path to Carcosa introduces a number of encounter cards that feature the new keyword, “hidden.” Whenever you draw a card with this keyword, you keep it hidden from your fellow investigators and place it in your hand. But even from there, its abilities exert their insidious influence over the course of your game. Additionally, The Path to Carcosa campaign introduces mechanics for Doubt and Conviction, both of which you’ll mark in your campaign log, depending on the choices you make. These decisions may then come back to haunt you in later scenarios. And, finally, The Path to Carcosa also marks the debut of a new card type, story cards, which serve as avenues for additional narrative… and other effects. The King in Yellow should be familiar to those who have played the original board game. With two new mechanics and more cards, there should be plenty for gamers to be excited about when it comes out this fall. You can find out more about the expansion here.